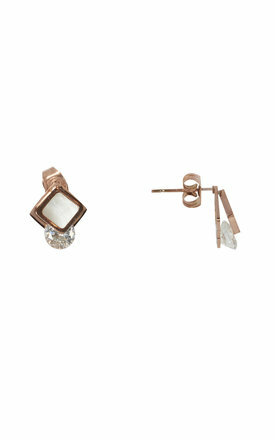 Mother of pearl with cubic stud earrings white. 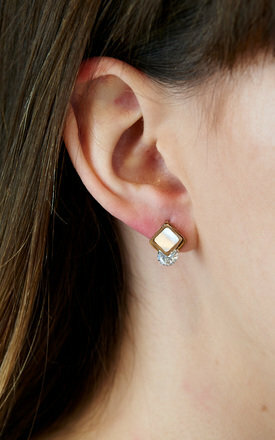 An elegant square stud with a decorative mother of pearl centre. The stainless steel boarder really makes the pearl centre stand out. A crystal stone sits at the bottom. Held by a little frame at the back, ensuring it is secure. Make this someone's beautiful Christmas gift or treat yourself. Stainless steel, mother of pearl, crystal stone, onyx. Front square is approx 7mm by 7mm. Back frame is approx 9mm by 9mm. Stone is approx 6mm in diameter.